You are currently browsing articles tagged sidewalk sale uptown dallas. Well known Granada Theater welcomes the local folk pop duo drops latest album Marry a Stranger from Kirtland Records. There is another surprise Jaret and Erik from Bowling for Soup will perform at 9pm and The Cush, the Triangleheads perform at 8pm. Granada Theater built in 1946 by Phil Isley, opened during the Golden Age of Hollywood as a 700 seated Movie Theater. Lovely theater showed many well-known classic Hollywood films from Marlon Brando to Audrey Hepburn. 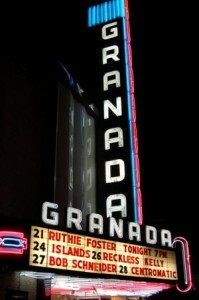 The Granada Theater is a great example of Art Deco and classic style of those years. Over the years Granada hasn’t changed as an architecture but management and style has changed couple time. 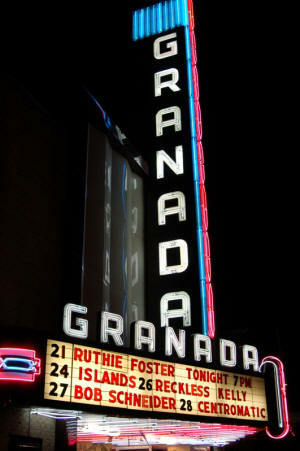 Granada opened doors again in 2004 as a better music venue with improved lights and sound system for Dallas music lovers. You will certainly have different experience at this lovely atmosphere that you will definitely enjoy. Which one is your favorite Blondes Vs. Brunettes? This is the name of the event at Cotton Cowl Stadium on August 11,2012…Blondes Vs. Brunettes means 22 girls running each other down on a football field for a good cause. The hugely popular event is benefiting the Alzheimer’s Association. The ladies hope to raise $275,000 this year. Tickets are $25 for this event and it starts 7.30pm at newly renovated Cotton Bowl Stadium. The Cotton Bowl Stadium is the centerpiece of Fair Park, a landscaped urban oasis renowned for its collection of art deco buildings, art and architecture. Cotton Bowl Stadium is located just two miles east of downtown Dallas. Don’t worry about parking, there are plenty of spaces, and the arrival of light rail transportation is a huge help for transportation to this area. It seems like it is going to be summer for a while in the city of Dallas but West Village has a Sale event from August 10 to 12 that you do not want to miss. You will find the hottest trends from special boutiques such as Pitaya and y&I with great prices. Demerara, Indigo, L. Bartlett and Kendra Scott are joining this great event. You can find 75% off apparel and accessories to home décor. West village is the location of this great sales event for summer trends. You will have a chance to enjoy lively cafes, beautiful restaurants and impressive lounges. The classical American architecture invites you inside from sidewalks lined with trees. West village is lovely, easily walkable shopping and dining district that you can enjoy your day. Most of the events start end of the days this weekend, we can look Dallas Homes for Sale, Plano Homes for Sale, Carrollton Homes for Lease, Frisco homes for Sale, Lakewood Homes for Sale, Shoal Creek Homes for Sale, Gleneagles homes for sale, Willow Bend Homes for Sale, Hunters Glen Homes for Sale, Kings Ridge Homes for Sale, Vickery Place Homes for Sale, Munger place Homes for Sale , McKinney Homes, Prosper Homes, Allen Homes for Sale, Addison Condos for Sale, Dallas Homes for Lease and surrounding areas in DFW during the day, feel free to contact me.